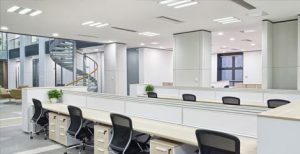 No matter what the size of your office, regular maintenance is required to both keep your workplace safe and to fend off future, larger problems. Health and safety in the workplace are not just something for larger, busy offices – but as a business owner, finding the time to keep on top of your building maintenance is not normally your top priority. Some office repairs are conducted on an ad-hoc basis: discovering the issue, calling round for contractors, getting a handyman in or fixing the problem yourself, however, this can result in greater, different issues. With call out fees, time spent on getting quotes or even DIY-ing the problem, the overall cost can be higher than a monthly retainer contract. In fact, this is true of anything that takes time away from building your business. Outsourcing your building facilities management is one step to safeguarding your workforce and keeping your focus on your business. Many general office maintenance issues may seem simple to remedy but over time these can grow and cause lasting damage to both the office and your bank balance. The small issue of a rusting pipe doesn’t seem much, but when it bursts during cold weather, the problems it causes are tenfold. Regular maintenance checks can help ensure that nothing is overlooked – and if problems arise, you have a better idea of the best way to solution it. Space Design Maintenance offer support in a wide range of property management such as plumbing & heating, electrical service and building maintenance. By proactively keeping the maintenance of your work space up to date, we are able reduce disruption in the office and pressure on your workforce. For more information on the services we provide, please see our Commercial Maintenance page. Are Construction Labour Laws Adversely Affecting Construction?